Fun little sari tips and tricks! Bindu demonstrates how to straighten and align your front pleats neatly at the point where they'll be tucked into the waist. Make sure the hem of the pleats lines up nicely with the bottom border. Fold and arrange your shoulder pleats neatly before you place them over your shoulder - and in the case of this heavy Kanchi silk sari, pin them in place. The sari is not the kind of garment, like a t-shirt, that you put on and wear all day and forget about it. Draped clothing is about constant adjustment and movement. But this is the charm of it. The pallu is made to be swept around back and front, tucked in at the waist when you're working, opened up and thrown over the shoulders like a shawl, or covering the head and neck and arms against the hot sun. The sari is a dance of fabric. One of the things that is the hardest to master is walking fast in the sari, going up stairs, down stairs - you'll feel the fabric tugging at your calves and this will mess up your stride and you already feel a bit self conscious anyway, being a woman in a sari, having the gall to show yourself in such a thing in perhaps, Texas? Using your left hand and grab the pleats - pretty much level with your crotch and lift up, use your left hand to lift the bottom hem of the sari up to mid calf. This helps a lot when going up stairs, and keeps the bottom of your sari clean. You think about this alot in India, and maybe even Texas. This is a beautiful graceful gesture that is part of wearing the sari. Indian ladies do not walk as fast or with as long a stride as westerners. This is one reality not to be overcome. Strolling is however, a good thing, especially in a hot climate. For faster paced walking you can just pick up either the pleats and tuck them in a bit higher or if you want the full length aesthetic and swish, you can discreetly lift the sari and petticoat by grabbing a handful of fabric just below the left hip and holding it up a few inches. This is often enough to prevent "sari tug". If you must motor unhindered, you can tuck your handful into the waistline. Silkier cloth is easier to walk in because the fabric slides rather than tugs against itself. Ah but you must pin the pleats and shoulder or you will experience "sari migration". 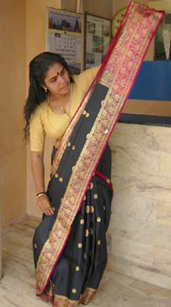 The top border of the sari that drapes across your chest tends to loosen with wearing. You can just pull the last wrap of fabric out of the waist and fold it once and tuck it in again over your left hip. There's no reason why you should not be out somewhere right now wearing a sari. The world needs more women in sarees! However, if you are a beginner and are too shy to go out right away, don't fret! Wear your sari around the HOUSE! Yes it's fun to cook a meal in a sari and the apron even holds the pallu down nicely so you can gracefully flit about your kitchen. Have a sari party and share your sarees with your friends for an evening! From wearing it a few times it will start to feel natural and after you've made peace with your big beautiful piece of cloth you'll just waltz out into public without a second thought. Check out the Sari Sisters page for inspiration.